Thomas Piketty's book "Capital in the Twenty-First Century" has become an overnight sensation with the leftists since its English edition was released 8 months ago in April 2014. The book basically explains inequality in developed countries by capital accumulation and concludes that inequality is because of unearned income and is passed down by inheritance. Although this may sound like an easy way for the poor to feel that all that has happened to them is because they were not born rich but reality is far from this naive view of inequality. Thanks to many astute researchers such as Jeffrey Frankel of Harvard, Piketty's data have been examined thoroughly and honestly (1). The problem is analysis and not the data. Piketty reminds me of Proudon, who wrote the "Philosophy of Poverty" where simply calling private property as theft made the poor feel good in thinking about inequality. His story was like a solace for the poor but it was scientifically incorrect. Marx wrote a critique of Proudon in his book "Poverty of Philosophy" which was more about economy theory and did not present much data. Long time ago, I discussed Marx's "Poverty of Philosophy" in details in my paper "A Theory of Uniqueness Value." Marx showed the analysis of classical economists like Adam Smith and David Ricardo in contrast to Proudon to be the way to do scientific analysis of capitalist economy than the presentation of Proudon. Marx as a socialist was critical of capitalist economists like Smith and Ricardo but would not sacrifice science in favor of sensationalism in economic theory. Marx's actual data was presented a long time later when he published his first volume of Capital. Unfortunately Marxists today have fallen so much behind Karl Marx's approach and are celebrating a sensationalist approach of Piketty albeit with a lot of data without even remembering what Marx showed in his third volume of Capital where he discussed his "Law of Diminishing Returns" about capital accumulation. This error in the yardstick when understanding economic data was not only particular to Proudon but the same goes for Piketty. The returns are measured in actual value and not the nominal price which is what Marx had shown in minute details in the first volume of Capital. Of course, by the time of publication of third volume of Capital, which was published posthumously by Frederick Engels, Proudon had long been forgotten. Contrary to Proudon and Piketty, Marx showed that inequality is derived from *earned* income. In other words, even the inherited wealth expands or contracts, based on the return of capital in the industrial society even if it had been accumulated in pre-industrial feudal era. Now, how about today? Can we explain the inequality of the post-industrial society by Marx's Theory of Surplus Value? Actually in the industrial sector of the economy, still the theory of surplus value works fine and shows the reason for inequality in that sector, but the more information economy grows, industrial sector is not the main sector of economy anymore. Then how can we explain inequality in the post-industrial sector? The answer to the above question has been the challenge of post-industrial thinkers in the last 50 years. 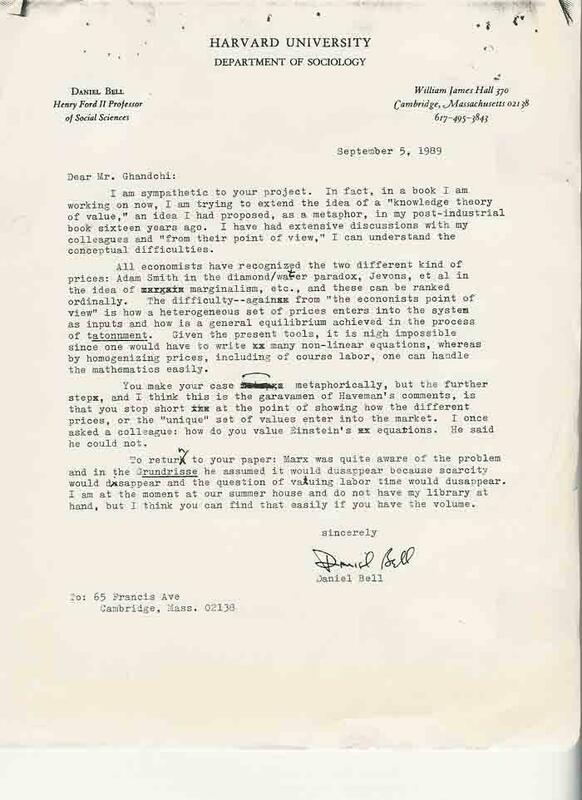 Late futurist Daniel Bell himself who coined the term Post-Industrial Society was working on a "Knowledge Theory of Value" and wrote to me about it in 1989. For Daniel Bell's letter, please see the link noted below (2). I do not know if Daniel Bell ever finished that project. But my paper about the topic which he had commented about in his letter, was written in 1989 (3). The point about inequality I published separately in 2003 under the title of "Social Justice and the Computer Revolution" after the 2001 economic downturn in Silicon Valley. The writing clearly showed that the new inequality in the post-industrial sector of economy, which was growing with the growth of Information Society, was still related to the *earned* income, albeit in the new economic sector, but it was based on the valuation of products as best, or considered the best, creating a superprofit for their creators, and this had nothing to do with formation of surplus value of the industrial sector which was still valid. (4). This theory was more widely presented by Robert Frank, maybe not knowing about my "Theory of Uniqueness Value" of 1989, and he called the theory as "winner-take-all" in 2001 (5). Actually Mr. Frank's wording "winner-take-all" is very appropriate to describe the new economic phenomena which is responsible for the growth of inequality in the post-industrial sector of post-industrial economy. Just looking at the wealth of individuals like Mark Zuckerberg exemplifies this new economic phenomena of our times. The question is what can be done about inequality rising from this new economic reality? Progressive taxation is used in all major economies which is really what governments can do and are doing and as Mr. Frankel notes "imagine that in the future we lived in a Piketty world, where inheritance and unearned income fueled stratospheric income inequality. Could a majority of the 99% still be persuaded to vote against their self-interest?" Moreover we know that neither Communist economies based on payment for the work, nor European welfare states using the need based compensation were able to solve the problem of economic injustice. In our times, many futurists are convinced to use non-governmental initiatives such as those proposed by Eric Drexler and Peter Diamandis to create abundance (6). Regardless of whether any of these new proposed solutions to address the 21st Century economic inequality will make a dent in the problem, I believe the correct understanding of inequality in our times as consequence of a winner-take-all mechanism in the post-industrial sector of the economy, is the first step in finding solutions for the problem. Ray Kurzweil's "Law of Accelerated Returns" is in a way an antidote to Marx's description of the trend he described about capital accumulation in his "Law of Diminishing Returns" for industrial economies. I have tried to apply Kurzweil's theory to look at food production, as a way to be able to achieve abundance of food, a basic need of humans, in other words to address inequality by creating abundance. I hope what is presented on the food issue can be useful to apply to other human needs such as clothing, housing, education and health. This was my goal in writing "Accelerated Returns in Food Production" (7). Unfortunately, mainstream economists did not take Daniel Bell seriously in economics and considered him just a sociologist. A half century later, we see predictions of Daniel Bell about coming of the post-industrial society proved to be the most correct. I hope today our mainstream economists pay more attention to what futurist Ray Kurzweil is proposing in his "Law of Accelerated Returns" because his proposal may prove to be the key in addressing inequality in 21st Century.